Please Note: This tool is intended to provide an estimate weight for a horse. Diamond S Horse and Cattle Company is not responsible for any injuries problems or incurred expenses arising from the use or misuse of this tool or any inaccuracy in the horse weight estimations. The most accurate way to determine a horse's weight is by weighing him on a scale. However, you can estimate a horse's weight (to calculate proper amounts of feed, dewormer, etc.) by using body measurements. 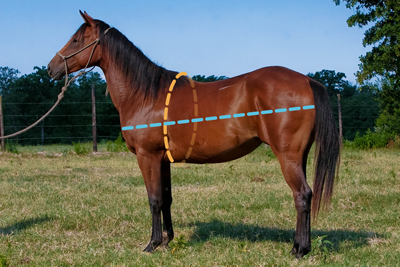 Weight tapes use a horse's heart girth measurement alone, but using body length plus heart girth¹ tends to be more accurate. The circumference of the horse's body measured from about 4" behind its front legs. The length of the horse's body as measured in a straight line from the point of the shoulder to the buttocks.